In one of the twentieth century's most incendiary and infamous first amendment trials, San Francisco poet, publisher and City Lights book store owner Lawrence Ferlinghetti was threatened with imprisonment for daring to print and sell the purportedly “obscene” work Howl and Other Poems by a formerly unpublished twenty-nine year old scribe named Allen Ginsberg. As shocking as it is sophisticated, Ginsberg's Howl is Beat Generation portraiture at its most poignantly primal wherein over the course of three distinct, flowing sections and a footnote, he uses words to photograph and recolor the lives of the post-World War II generation of the artists, wanderers, addicts, outsiders, dreamers and madmen encountered both in his circle and in the mirror. 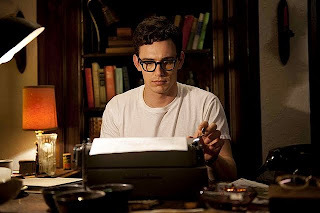 And much like a photo that develops and reveals more over time, Ginsberg (portrayed by James Franco) is the first to admit in an often quoted interview recreated in Rob Epstein and Jeffrey Friedman's fascinating film, that at times, even he doesn't realize exactly what he meant with certain turns of phrase until they come into focus years later. Artistically, we discover that Ginsberg was inspired by Walt Whitman and William Carlos Williams as well as his handsome On the Road author and friend Jack Kerouac's stream-of-consciousness experiments with automatic writing that ensured that the act of creation was as natural and uncomplicated as breathing. 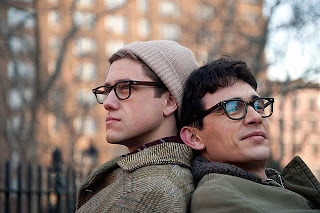 Inspired by a man he met in a mental institution named Carl Solomon, which evoked subconscious feelings the writer hadn't faced surrounding his mother's battle with sanity and his own homosexuality, Ginsberg's sprawling epic of jazz phraseology is celebrated, artistically interpreted, occasionally analyzed and subtly deciphered in the filmmakers' daring cinematic opus. Undoubtedly using the titular work as its cinematic muse, the 2010 Howl moves freely around in time, place and approach to avoid turning into a Court TV style rehash of the case, a Ginsberg biography, melodrama or performance piece. The directors transcend what may have easily been a limiting decision to base all dialogue on actual interviews and transcripts by transforming it into a tapestry of all of the above that – much like Howl – defies any one stylistic label. 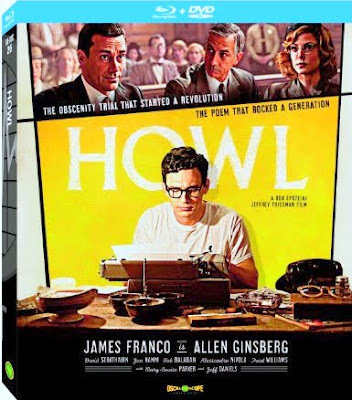 Terrifically transferred to a breathtaking Blu-ray release, which turns the jazz staccato rhythms of Ginsberg's near paragraph length howling breaths of descriptions into a newfound contact high of high definition, Howl primarily divides its eighty-four minute running time into three distinct locales. The movie opens as it should, with the consummate chameleon James Franco nervously building up the courage to tell the audience that he's “seen the best minds of” his “generation destroyed by madness” as he launches into the work and the filmmakers move back-and-forth between the 1955 debut poetry and their animated interpretations of his famous stanzas. Admittedly it's a bold approach and initially as jarring as watching the animators of Fantasia force their own theories of what the work means onto viewers who may probably get much more out of it if they created their own mental pictures to resonate with Ginsberg's work on a more intimate level. 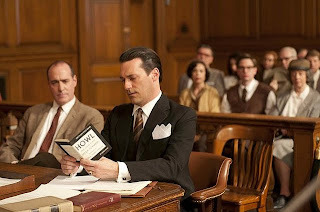 But ultimately and with only a few notable exceptions here and there, this technique that's also reminiscent of Waking Life , Chicago 10 , Persepolis and Waltz with Bashir , reinforces the thesis of the film and the case that Ferlinghetti's attorney (played by Jon Hamm) tries to make at the trial, which is that Howl has artistic value, whether or not one finds certain phrases obscene. 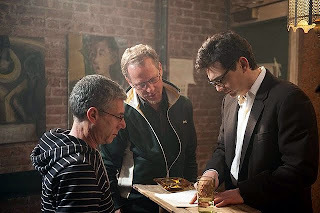 In addition to highlighting the poem itself, most of the drama in the work is found in the filmmakers' recreated footage of the trial held two years after the reading along with an extensive interview that seems to take place simultaneously as Ginsberg recounts life before, during and after the writing of Howl in his apartment. 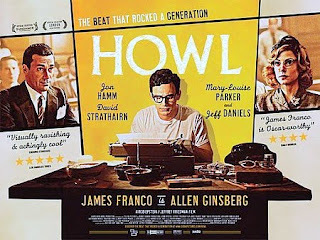 Passionate in its scope and subject, Howl is incredibly successful thanks to the impressive Franco and some scene-stealing speeches served up by Hamm and Bob Balaban in the courtroom sequences, which stirred up the same freedom fires that David Strathairn (who is also present) stoked in Good Night, and Good Luck . All in all, Howl is an artistic triumph that -- now on disc -- will hopefully provoke and/or seduce another generation of young Americans to challenge the status quo through the revolutionary act of creation rather than the pointless act of destruction.